When Gina Castelli was a young girl, she used to hone her ball-handling skills by dribbling up and down the steps of her house. She parlayed that drill and many hours of practice into a stellar career at Archbishop Carroll and then at Canisius College before embarking on a coaching career that has resulted in over 400 wins. At Archbishop Carroll, Gina received all-Catholic honors in basketball three times and volleyball twice at a time when Title IX was just starting to enhance women’s athletics. She averaged 18 points per game as a senior. Canisius College and Greater Buffalo Sports Hall of Famer Sister Maria Pares came calling and Gina embarked on the finest four-year tenure of women’s basketball in the college’s history. 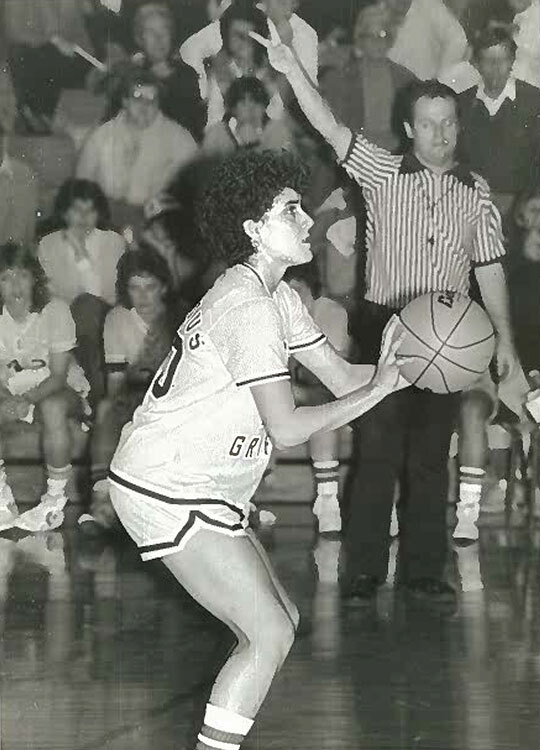 With her occupying the point guard position, Gina led the Griffs to an 82-34 record and a berth in the Elite 8 of the 1983 NCAA Division II championship. That season was a magical one with Canisius winning a school record 28 games and finishing the year ranked 8th in the country. She was an Honorable Mention Freshman All-American that season. During her career, Castelli averaged 13.1 points and 5.0 assists and was named a third team All-American as a junior. Over 30 years later, she still ranks among the top five in school history in points, assists and steals. Gina was inducted into the Canisius Sports Hall of Fame in 1997. With her playing career over, Gina found a way to channel her passion for basketball by teaching others how to be champions on and off the court. She was the fourth youngest coach in the country when she was hired at Siena at the age of 27 and in 22 years behind the bench Castelli posted a 336-296 record that included 225 victories in conference play. Five times she was named the league’s Coach of the Year and twice earned Division I Coach of the Year honors from the Basketball Coaches Association of New York. Her Saints won seven regular season conference titles and went to the post-season four times. Forty-one of her players were named all-conference with seven being named MAAC Player of the Year. She is the winningest basketball coach in Siena history. In the classroom, Castelli’s teams enjoyed unparalleled success. The graduation rate of her student-athletes was 100% while in Loudonville, and Siena was recognized by the NCAA twice for recording a multi-year Academic Progress Rate (APR) in the top-10 percent of all Division I women’s basketball programs. Of the 64-team NCAA Tournament field in 2001, Stanford was the only other institution to have graduated 100 percent of its incoming players over a seven-year span. Castelli was also active in the Capital District Community; and she lists The Women of Excellence Award she was presented in 2010 for her community service work as one of the highlights of her career. Gina is currently the coach at LeMoyne, where her teams have posted a 77-65 mark in five years. Her overall coaching record at the end of the 2017-18 season stands at 413-361.